The taisha is scary and hair-raising. Ways to Avoid the Taisha!!! 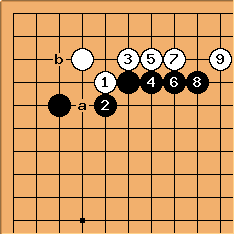 The move is called taisha in Japanese, or large slant move. 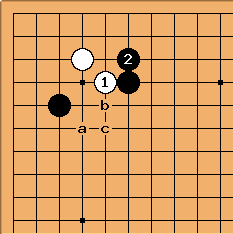 With Black offers White an opportunity to cut, knowing that Black can cut White as well in return, leading to a complicated fight with many variations known as the taisha joseki. This page explores the options White has to avoid these complications and simplify the situation. The main idea is to create a situation, where White can either cut Black without being cut itself or establish itself on the side. The three main options for White to achieve this are a (the most common play), b and c (the simple way). 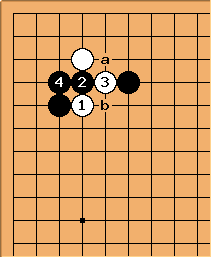 t leads to the taisha joseki but there is scope for simplification there too. The follow up in the corner is large, either at a for White or b for Black. 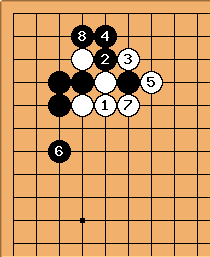 This joseki dates back to the 19th century (first played by Honinbo Shusaku against Honinbo Shuho, 1854-10-22), but it was not very popular during the 20th century. In the 21st century it is seen more often again, especially in China. must not jump above . See Question About Avoiding The Taisha. 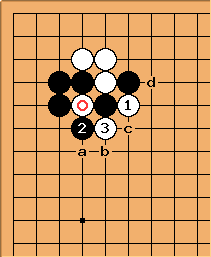 With at this position transposes to the 3-5 point low approach one-space low pincer, kosumi. Another time honoured move is the underneath attachment . Black has a major option to either draw back at a or hane at b. a defends the threatened cuts, but allows White to establish itself firmly on the upper side, b allows the cut leading to a fight. The underneath attachment allows Black to choose whether to calmly draw back or to start a fight by playing the hane. 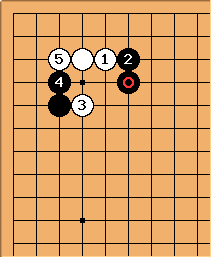 This move was common in the mid-19th century (first played by Ito Showa against Honinbo Shuwa, 1851-03-29) and was played significantly less later on. 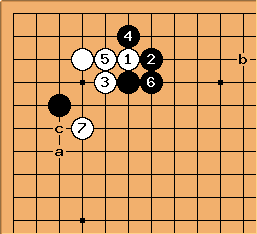 A later proponent was Go Seigen who played it in several games during the 1930s. This move transposes to a joseki after the 3-5 point low approach, press. 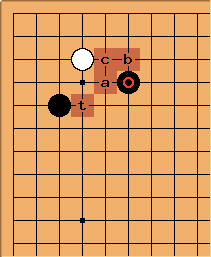 While the press is usually played to build a framework, the initial offer of a taisha joseki may indicate that the outward influence is less efficient in this case. aims at the cut of a, has no choice but to defend, then moves out and establishes a white group on the upper side. Later Black has a good follow-up at b. 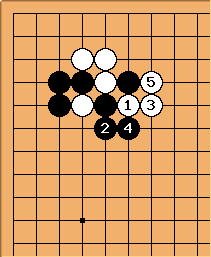 A white move at c is considered honte - and was usually played with colours reversed in no komi games. If blocks to build on the upper side, cuts. This position may arise after the 3-5 point low approach one-space low pincer, if White bumps against the pincer stone. 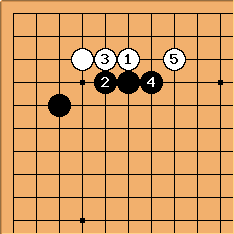 In this way Black gets a lot of territory, but White has beautiful thickness in sente. With Black has other options as well. is also regularly seen in professional games. ...so he could play like this instead. ( is played at a, b, or even c if Black has large ko threats.) 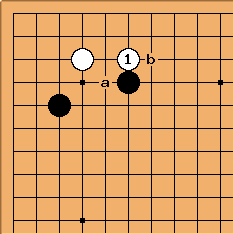 White at d is called "cowardice" by Kogo's Joseki Dictionary. Imagist: In all seriousness, this actually does prevent the taisha. Tamsin: For what my thoughts are worth...don't avoid what you fear, but confront it! If you want to get strong, take on the challenge. Study the taisha and study the large avalanche, and feel confidence when things get wild! Bob McGuigan: The Workshop Lectures, volume 1, by Yang Yilun, published by Slate and Shell has very good material on playing complicated joseki. It is based on the idea that if you pay attention to fundamentals you can play these joseki without having to memorize thousands of variations. Imagist: For beginners (20k or weaker) I do think it's best to avoid the taisha since the fighting that it leads to is pretty far beyond their comprehension, so there isn't likely to be much learning. But I personally love the taisha, since it gives me a chance to practice reading. Tas: Why do a 20k even know the taisha? As a beginner the time is far better spent developing a basic instinct, than to memorize a complicated joseki sequence. Bob McGuigan: I think Bill pointed out that, strictly speaking, once Black plays there is no way to avoid the taisha. This page shows how to avoid the more complicated variations. Calling the page The Taisha: How To Avoid the More Complicated Variations isn't as catchy a title, though. For White to avoid the move White's first move in that corner would have to be something other than komoku or else, assuming White played first in the corner, White should not tenuki when Black approaches. On the main taisha joseki page Charles makes a comment about taisha proper being the complex variant taisha linguistically indeed refers to the ogeima leading to it.